SAN PASQUAL VALLEY — The San Pasqual Academy Dragons finally have a home field. SAN PASQUAL VALLEY (September 28, 2011) - Surrounded by orange groves, with mountains to the north and south as a backdrop, it is a field of hope and a home for kids who need both in abundance. 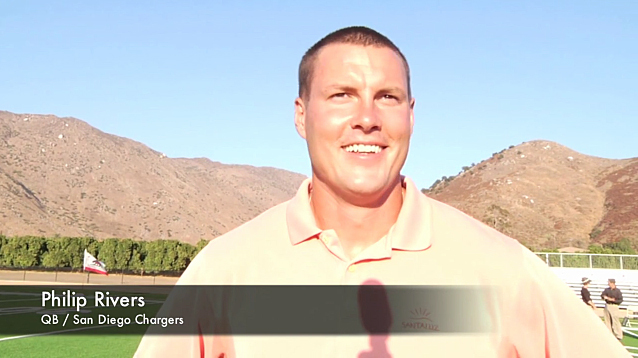 “There won’t be a field where Quentin (Jammer) and I will travel to or play on anywhere in the NFL that’s any better than this one right here,” said Chargers quarterback Philip Rivers. He was on hand for the ribbon-cutting Monday afternoon at the foster-child residential school in the eastern part of the San Pasqual Valley, about four miles east of the San Diego Zoo Safari Park. The quarterback’s charitable foundation, Rivers of Hope, as well as Jammers’ Jammer Family Foundation, helped fund the new field, where the 132 students who attend the academy can play both eight-man and 11-man football, depending on the size of the competition’s team. The NFL and several other organizations and businesses also contributed to the million-dollar project. Permanent bleachers are coming soon, and a new scoreboard has been erected. No longer does the team have to play its home games in Ramona, where few of the students could go to watch. The academy was the nation’s first residential high school for foster children when it opened in 2001. The teens who live and learn there are dependents of the Juvenile Court in San Diego County. They are victims of child abuse and neglect and have been unable to reunify with their families, live with a relative, or find a permanent home through adoption. The county bought the 238-acre campus in 1999 from the Seventh-day Adventist Church, which had operated the campus as a boarding school for more than 40 years. Over the next two years, using $14.5 million funded through a public-private partnership, the campus was renovated. When the school was built it did not have a regular football field, and the school’s team had to play on a makeshift, nonregulation field. Eventually, in 2008 when the team began playing in an 11-man league, they had to play all their games on the road. “I think its great because we get to have home games and not go off campus and we can do other sports, not just football,” said Samantha, one of the students who came to the ceremony, catered by Phil’s Barbecue. The ceremony was hosted by County Board of Supervisor Ron Roberts, who along with Supervisor Greg Cox, have championed the school from the beginning. “Is this beautiful or what?” Roberts said to loud applause.